It is the one thing that all hearts of human being love regardless their different colors, religions, or races. It is every soul’s dream and every mind’s demand. Although most of us love justice and search for it, it is unfortunately not applied in our real life. In this article, we will stop for while and search deeply for the concept of justice according to Islamic teachings. Justice is always connected in people’s mind with judges in courts and presidents who rule. They have this narrow concept whenever they hear the words” justice”. In Islam, you can’t talk about justice and rules and you are unfair at your home with your family, unjust at your work and your opinions and evaluation of other are far away from being fair and objective. It also puts emphasis on the importance of justice with partners and preserving their money in business dealings. Moreover, it asserts being just between husband and wife in case of martial problems or conflicts. So, we are all judges and responsible in our areas of responsibility and we must take care of our actions and decisions and check it objectivity . In order to reach justice in any community in general and in Islamic community in specific, there must be certain rights, duties, and rules for every one to follow. Nowadays, many are suffering because of ignorance of their rights and duties. One can find a man who deprives his wife and children from their owns rights. One can also see many examples of employers and companies who set unclear rules and laws for their employees and look only for the laws that support their personal interests. Even in wars, Islam gives a lot of direction to show how to deal with enemies. In Islam, enemies have and know their rights. Under normal circumstances many people can be just. But Islam commands its followers to be just even in the face of strong conflicting emotions. In dealing with other human beings, two major impediments to justice are love and hatred. This Qur’an verse from An-Nisa (The Women) is recognized as one of ‘the greatest expressions of justice in history’ by Harvard Law School. Established in 1817, Harvard Law School is one of the oldest and most prestigious institutions in the United States. 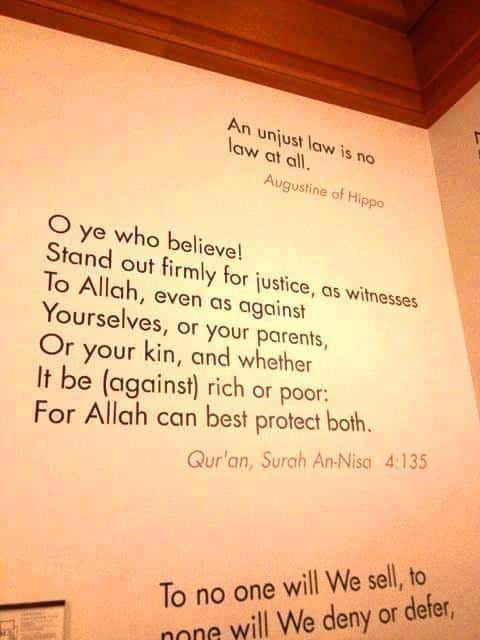 This quote, taken from the Holy Quran.com/4/135, has been posted at the entrance of the Harvard Law School faculty library as part of an art installation that aims to display ‘the greatest expressions of justice in history’. The exhibition, called The Words of Justice, features around two dozen quotes relating to law and justice from various periods of civilization. These are displayed at four areas of the library: the entrance wall, the east conference room wall, the end wall and the roof garden wall. 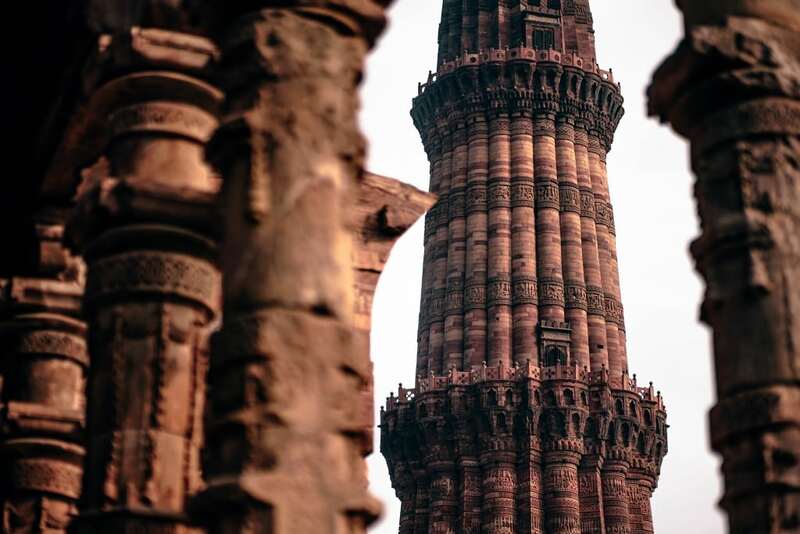 The An-Nisa verse is one of the three most prominent displays on the entrance wall. According to the exhibit’s official website: The words on these walls affirm the power and irrepressibility of the idea of justice. It reflects a hope that the aspirations and ideals expressed here will continue to inspire all who struggle for laws that are just. Indeed, The sole purpose of sending the prophets was to establish Justice in the world and end injustice. 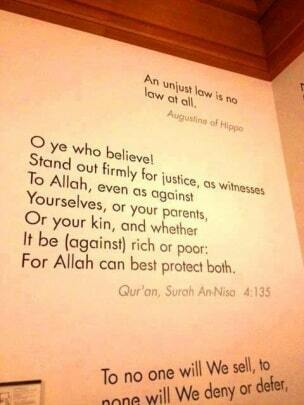 There are much more example to elaborate justice in Islam. That is the justice the world needs today. Quran insights in troubled reality, by Motaz Abdelrahman.